Hire a great party extra, the Didicars with track! 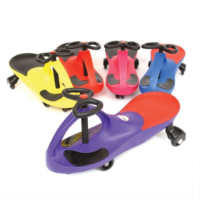 These are real crowd pleasers and we now have repeat bookings time and time again requesting these awesome wiggle cars. 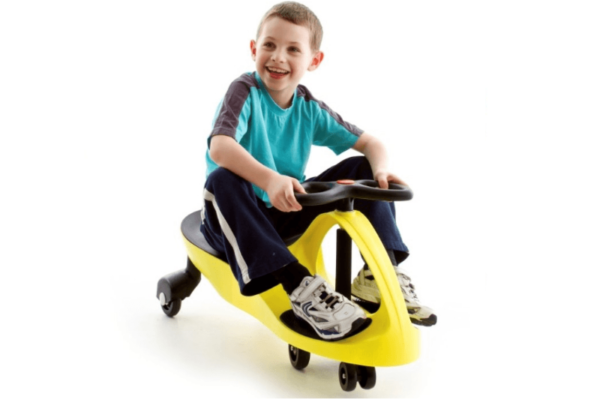 Simply put your feet up and wiggle the steering wheel and away you go! 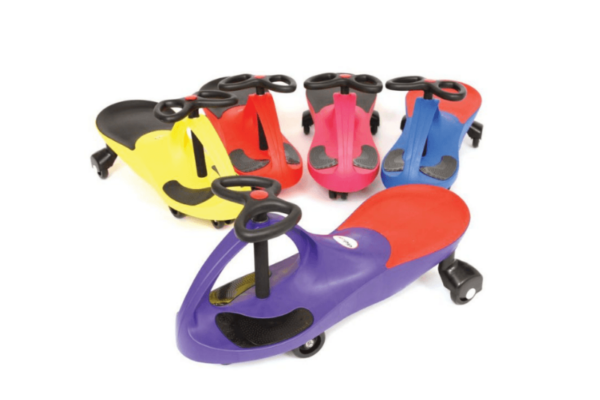 THIS IS AN INDOOR HIRE ONLY – THESE ARE FOR INDOOR USE ONLY – DO NOT USE OUTDOORS. Please Note some extras may not be in stock on your chosen date – if they are not we will contact you and amend your order. WANT YOUR HIRE TO BE DIFFERENT THAN OFFERED? 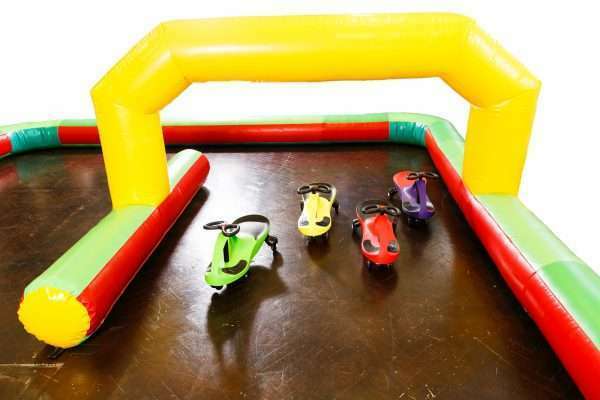 Inflatable Didi Car racing track and cars – F1 Fun for your party. 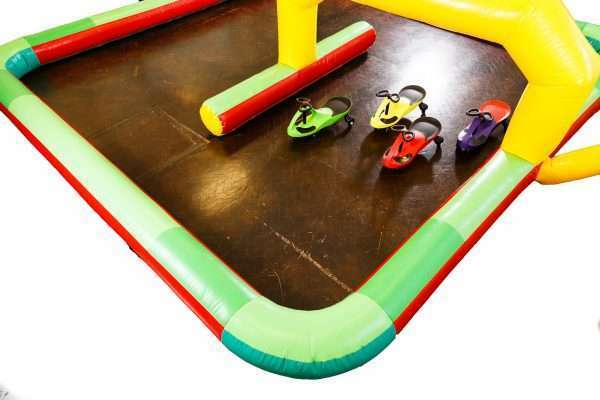 Another incredible Indoor Party Package from Total Bounce! 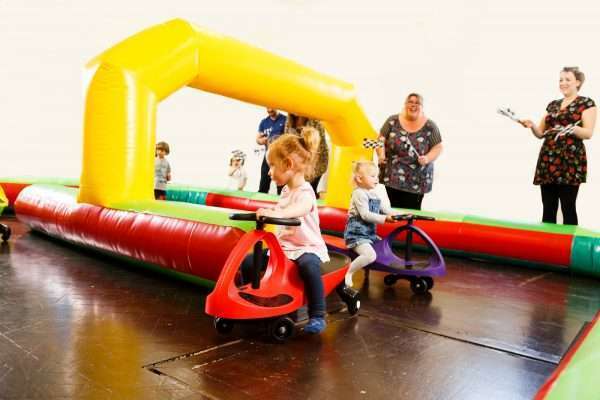 – Our Didi Race Course with 4 individual coloured cars is fantastic for all events, from birthday parties and fun days to christenings and weddings! Guaranteed to be a hit with all your guests! – Also available without the track here. Note: We do not advise mixing age groups to minimise the risk of any accidents or collisions on the units. Safety is the cornerstone of what we do (it’s not all fun and games!) – Here’s a brief guide of our compliance with the BSEN14960:2013 and how we go above and beyond the requirements to fulfill our obligations. All our electrical equipment is PAT TESTED (annually) with visual inspections done on EVERY hire and bi-yearly records made. 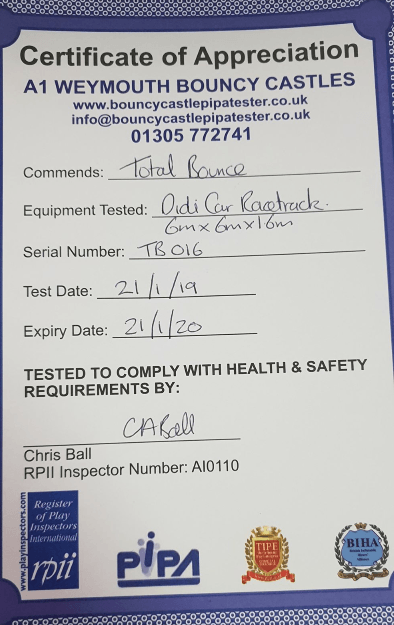 All our inflatables, soft play and games are safety tested every year and carry appropriate RPII or PIPA certification (see below for this units records). We are also registered on the national RPII database of accredited controllers and operators, this ensures our set-ups are done properly and to the current recommended HSE guidelines. For more information on our Health and Safety and our due diligence please click HERE. Unit Has Been Professional Inspected by A1 Weymouth Bouncy Castle Inspection – who inspect on behalf of Pipa and RPII – This unit does not need to meet BS:EN regulations as it has no inflatable bed, however we have opted to have an annual inspection and the above mentioned inspectors self certification certificate (As below). 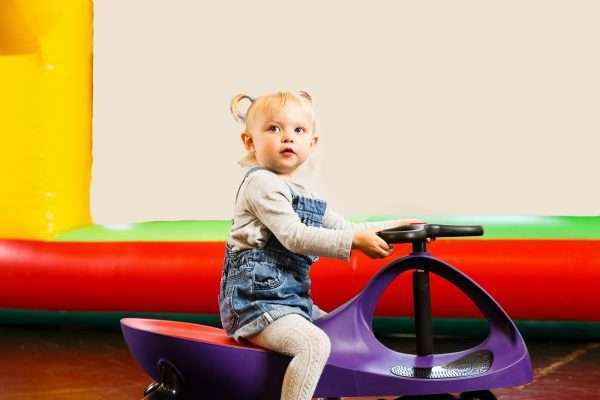 hired soft play with ball pit, bouncy castle, didi cars and a music box from Total Bounce. Fantastic customer service from start to finish. Highly recommended. Had the most fantastic party. I highlyrecommend getting the add on of the didi cars and the music box! This was a party for children ages 1 to 5. Will deffientley be using again. 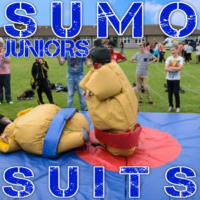 Hired the sumo suits for a community funday - they were a smash hit!! The staff from total bounce were easy to deal with and friendly both before hand and on the day. Will definitely use again!! great service made my grandsons birthday couldnt do enough for you great guys will definitely book again !!! Cannot thank you guys enough for everything you have done this week. Really made my son's 1st birthday as amazing as we could have possibly hoped for. What a fantastic company, great staff, great prices. Would recommend to anyone and everyone. Absolutely perfect service. Thank you so so much!!! Fantastic 10☆ great communication.. arrived on time! Very friendly and chatty.. my daughter had the rainbow bouncy castle for her birthdayshe loved it. Willl recommended and will definitely use again! And great memory as used them almost 2 years ago and remembered that it was a super hero party! !Thank you!. These guys helped me select a castle suitable for the venue ceiling height, set up and collected on time, added a pirate theme and were generally very friendly! Thank you very much. I would definitely use Total Bounce again! I hired the disco dome yesterday for my daughters 16th birthday, it was a complete hit! All ages enjoyed it, great communication, prompt delivery, set up, collection etc, definitely would recommend this for any music lovers. Thank you total bounce, will definitely be using you again. Used total bounce many times. Great service fantastic value.lovely staff. Highly recommend 5 star all round! Fantastic service, great value, on time and kids loved it for a second year running! Perfect, great communication and service. Due to a cancelled booking, we were also allowed to keep the castle for an additional day free of charge, much to the delight of our children. Will use again and would recommend to anyone. Hired a slide and the disco dome for my childs birthday. Lee and Andy were excellent and the kids all had great fun. Top service supplied by Total Bounce! Lee was professional and efficient. Disco dome, Diddy cars and Sumo suits were a really fun combination for our daughters party. fantastic Service... Really good with the kids, excellent bouncy castle :-). 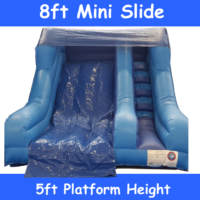 Hired a bouncy castle with slide for my daughters 3rd birthday party, the guys were friendly and punctual and I will be booking with them again in the future. Definitely recommend. Had the slide for my son's birthday and all the children loved it. Amazing service too. Thank you so much for everything. Would recommend. 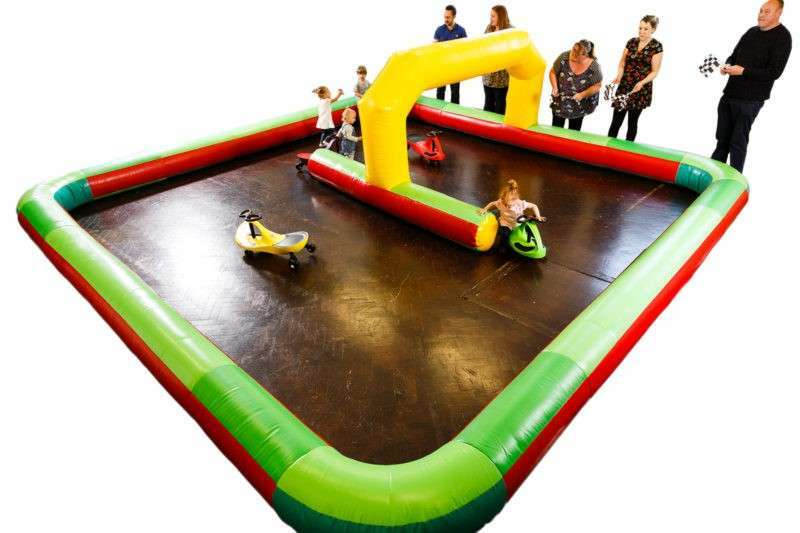 I hired a soft play set and the junior sumo suits for a family party at the weekend and they were a great success, they kept the children quiet and entertained while the family had a good catch up and every said how great they were. Great service, on time and good quality products. Thanks very much it made the party and everyone said what a great idea it was. I was so impressed, from booking to collection of the castle. We will definitely use you again. Would recommend to anyone, great staff, great service, great communication and great price. Thanks! 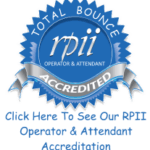 I have used total bounce the last 2 years for my daughters parties and once again have booked with them again for this year. 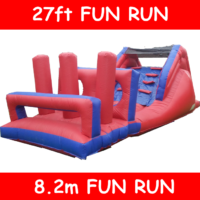 They have a great selection of inflatables, are very quick to respond to your messages, helpful and fantastic on the day with a quick set up and take down. I wouldn't use anyone else!!! 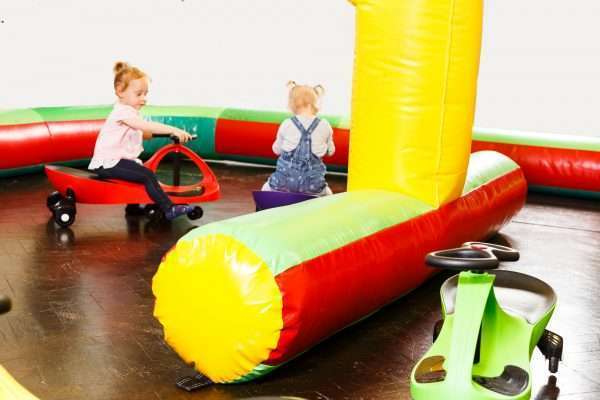 © 2019 Red Pickle Enterprises T/A Total Bounce Bouncy Castle & Soft Play Hire - Main Office: 77 Longridge Way, Weston-super-Mare, BS24 7HA.